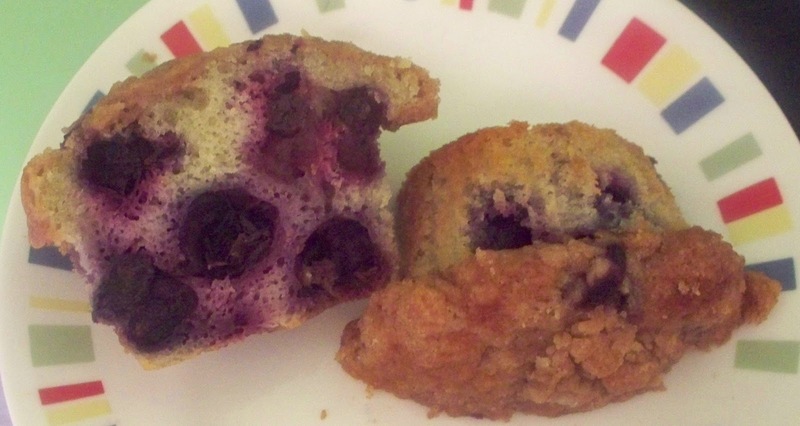 Yup, there are that many blueberries in this muffin. That is why it is so good! Mix butter, brown sugar and 1/4 cup sugar together in a bowl until fluffy. I'm not exactly sure what fluffy mixed butter looks like but I guessed that once everything was combined and mixed for another few seconds that I had achieved fluffiness. Add 2/3 cup flour and cinnamon to the bowl and mix until it looks like a crumb topping. Set it off to the side of the room to use at the end of the recipe. Whisk together remaining flour, baking powder, baking soda, and salt in a bowl. In a different bowl, whisk together the vegetable oil, remaining sugar, eggs, sour cream, vanilla, and lemon zest until well combined. Pour the batter into the dry ingredients, mixing just until combined. Distribute the blueberry batter evenly in the muffin tin. Sprinkle the topping made at the beginning of the recipe all over the batter. Let the muffins cool in pan for 10 minutes and then pull them out of the pan to finish cooling. If you serve the muffins warm, they will most likely not come out of the liners cleanly, but with that being said, I cannot advise against a nice warm muffin.